Ryan Murphy is 17 and a senior at Maine South High School in Park Ridge, Illinois. 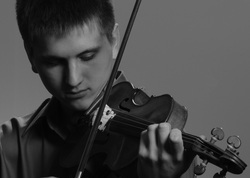 He is a violin student of Almita Vamos, Roland Vamos, and Marko Dreher and is a merit scholarship student at the Academy of the Music Institute of Chicago. Recently, Ryan won the Arthur D. Montzka Young Artists Competition and soloed with the Kishwaukee Symphony Orchestra playing the first movement of the Sibelius Violin Concerto. Ryan was the grand prize winner of the Olympic Finals of the Granquist Music Competition, and also a first place winner of the Oak Park/River Forest Symphony Orchestra competition, and soloed with that orchestra, playing the first movement of the Tchaikovsky Violin Concerto. Ryan won the North Suburban Symphony Orchestra competition and soloed with that orchestra playing the first movement of Lalo’s Symphonie Espagnole. He won a first prize in the junior division of the Walgreens National Concerto Competition, second place in the senior division, and first place in the Music Teachers’ National Association Illinois Junior Strings Competition. Ryan has also been a finalist in the Skokie Valley Symphony Orchestra Young Artist Competition. Ryan has performed solo works at various venues including the Chicago Cultural Center, the Art Institute of Chicago, and Nichols Hall. This year, Ryan was selected to participate in the Lennox International Young Artists Competition and the Corpus Christi International Competition for Strings, and was an alternate for the Stulberg International String Competition. Ryan was also invited to play a recital in the Steinway Young Artists concert series this year. Ryan has performed in masterclasses for musicians such as Ilya Kaler, Yo Yo Ma, Alice Schoenfeld, and members of the Avalon and Vermeer quartets. As a chamber musician, Ryan’s groups have won the Rembrandt Chamber Music Competition, the Society of American Musicians chamber music competition, the Chicago National Chamber Music Competition, and have been semifinalists at the Fischoff National Chamber Music Competition. Ryan has performed with his chamber group on NPR’s “From the Top”, three times on WFMT’s “Introductions”, in the Harris Theatre, the Chicago Cultural Center, Nichols Hall, the Art Institute of Chicago, and the Houston Grand Opera House. During summers, Ryan has studied as a merit scholarship student at the Meadowmount School of Music in New York and the Green Mountain Chamber Music Festival in Vermont. He has also studied at the Okemo Young Artists Program in Vermont.